Intaglio print with chine collé. Altogether, eight 4x3 inch plates were used to create this print. Only 2 plates contained etched images: of overlapping sine waves, and of a pale gray feather. Chine collé was used to apply a 4x3 sheet of Japanese paper with prominent strands of kozo fiber embedded in it. 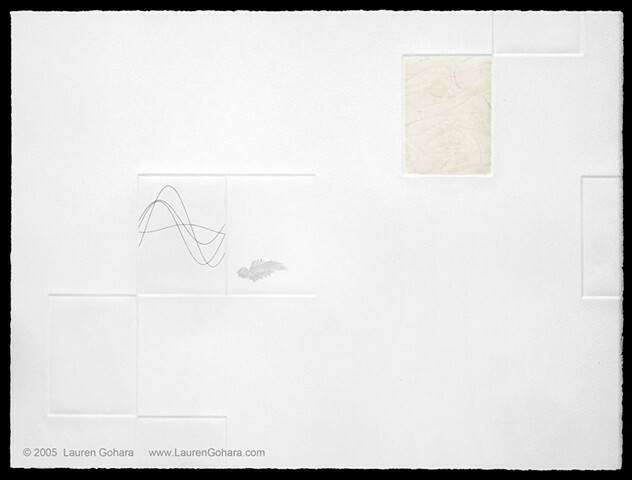 The debossed marks of four blank plates reinforce the grid, framing the physicality of the paper itself.